Corporate partners Edwards & Co have donated over £60,000 for the charity over two and half years. Bowel cancer is the third most common cancer in Northern Ireland and the second biggest cancer killer. Every year around 1,100 people are diagnosed with bowel cancer in the country and around 400 people die from the disease. However bowel cancer is treatable and curable especially if diagnosed early. In 2016, employees at Edwards & Co called upon their clients and neighbouring businesses to join them in a ‘Cathedral Quarter Bake-Off’, entering their cake into a competition for our Be a Star, Bake a Cake fundraising campaign raising over £1,000. A third of Edwards & Co staff were inspired to run the Royal Parks Half Marathon in October last year after a colleague sadly lost his wife to cancer, raising over £10,000 for the charity. Most recently Edwards & Co, in partnership with Novosco, bought together 15 other local organisations to row the equivalent distance of a marathon on a rowing machine, raising over £15,000 for the challenge. 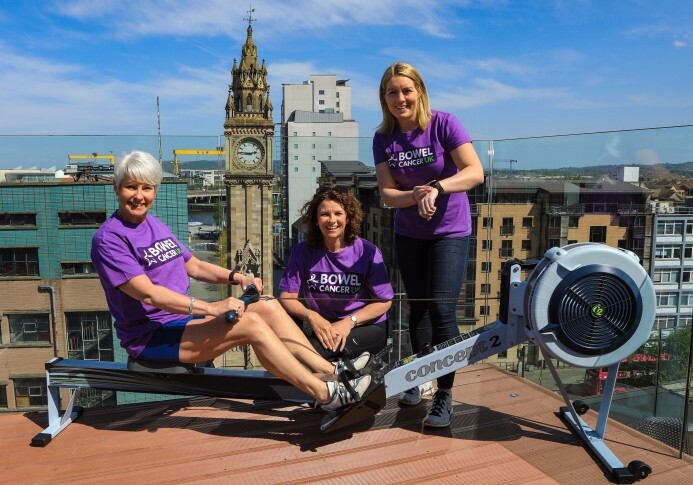 Solicitors, barmen and women, personal trainers, financial advisors and even a ‘stag do’ got involved and rowed in Belfast. I am so proud of the £60,000 we’ve raised – for a company of only 32 people, it’s fantastic! Senior Partner of Edwards & Co, Dorcas Crawford, says: “The death of my close friend to bowel cancer was very much the inspiration for our fundraising for the charity. Having attended a Bowel Cancer UK awareness talk in our office our staff became conscious of the devastating effects of this disease on the entire community of Northern Ireland. We made the unprecedented decision to name Bowel Cancer UK our charity of the year for two and a half years. I am so proud of the £60,000 we’ve raised – for a company of only 32 people it’s fantastic. Luke Squires, Director of Fundraising at Bowel Cancer UK, says: “We are so grateful for the amazing support and fundraising efforts from everyone at Edwards & Co over the years. Not only have they organised numerous events to raise vital funds for research and lifesaving work to help stop bowel cancer, but they’ve helped us to increase awareness of an often underfunded and misunderstood disease, and the charity itself, to a wide range of people living and working in Northern Ireland.